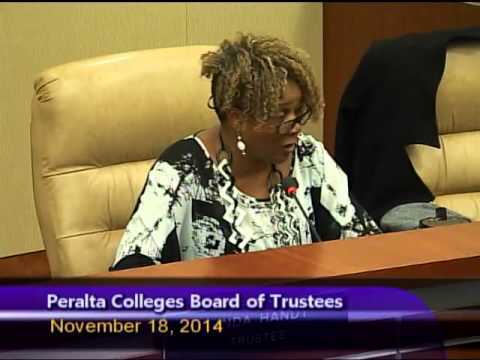 Board of Trustees Meeting that was held on November 18, 2014 at the District Boardroom. 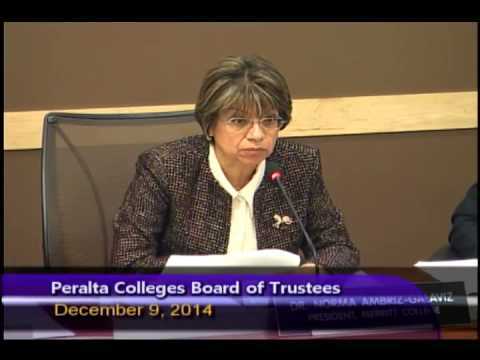 You are invited to provide comments on a new, fifth Redistricting Alternative for the Peralta Community College District’s Redistricting Process. Four alternatives have previously been reviewed by the public at several community meetings, and a fifth alternative has been prepared for consideration and public review. The new Alternative, developed in response to public comments from the original four alternatives, will be introduced at the September 27th Board of Trustees Meeting, 7 p.m. at the District Offices, 333 East 8th Street, Oakland, 94606. For more information on redistricting, CLICK HERE!